So sad to hear of a shop closing, but does seem to be the wave of the future. Yes it does seem to be. I always enjoyed going to their shop, the owner teaches classes too so there was always new items in the store and lots of ideas. It's always sad to hear of a business closing. I think minis and scrapbooking have taken a huge hit in the economic downturn because they are 'mum' hobbies and when money gets tight in a household it's mum's discretionary spending that is sacrificed first. Add the online business to that and it's tough alright. Looks like you did a bit of good shopping tho. PS - forgot to mention, the airdrying clay pieces look good. 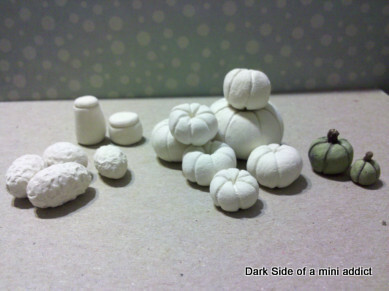 I love the stuff myself, have never got into polymer clay for a number of reasons - one being that I think it could become quite adictive :) I like that you can do a lot of individualising with paper clay when you do the paint finish. 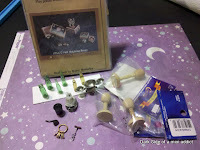 Polymer clay is fun, and I have a few mini dolls (my mom made me 2, and I bought one). The mixture of translucent and flesh tone clays really add realism to the dolls, but there is the whole you really should not cook it in your stove because of the fumes it can create... I have some in a box that I will eventually pull back out and use but for now its paper clay. And yes I completely agree about the paper clay and on the individualizing it afterward with paint. It really gives you the ability to age things quite well. Plus you can even carve, scrape and sand the pieces.